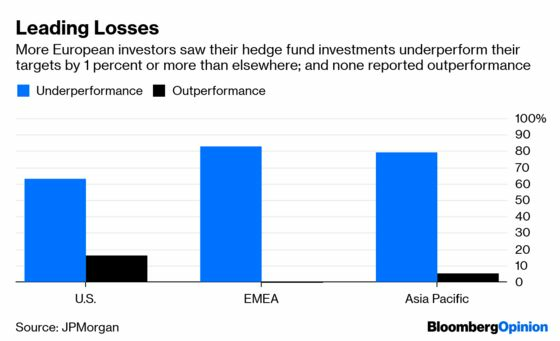 (Bloomberg Opinion) -- It’s well known that hedge funds had a disastrous 2018, collectively delivering returns that lagged what investors could have achieved by putting their money into simple index trackers. But suppose you’d made even less than your peers and, adding insult to injury, had paid more in fees for that underperformance. You’d probably be scaling back your asset allocation to the hedge-fund sector, right? JPMorgan Chase & Co. just published its annual global survey of hedge-fund attitudes and intentions among 227 institutional investors managing more than $700 billion. It turns out that investors in Europe say they were shortchanged by more than their counterparts in either the U.S. or Europe last year. The survey showed growing pressure on hedge-fund managers everywhere to reduce their fees, with 54 percent of all respondents saying they have secured or will negotiate reductions, up from 48 percent in 2017 and from 38 percent in 2014. Moreover, 17 percent of those surveyed said they obtained a “1 or 30” fee model last year, almost a threefold increase from the previous year, while 85 percent said they anticipate even lower fees in 2019. 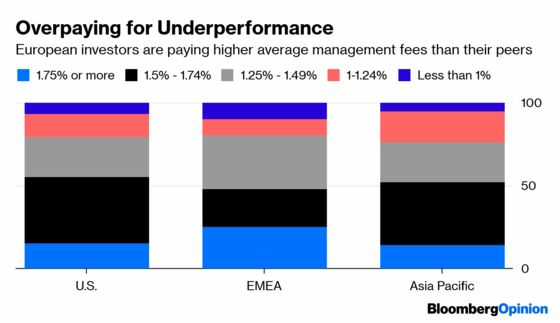 But a quarter of European asset managers said they’re still paying management fees of 1.75 percent or more — a bigger percentage being charged at the top of the scale than elsewhere in the world. So it’s something of a surprise to discover that 42 percent of the Europeans surveyed are planning to increase the amount they allocate to hedge funds this year, more than their peers in either the U.S. or Asia. For sure, there are plenty of market watchers anticipating a rebound in volatility that could provide better profit opportunities for hedge funds. “The fourth quarter of 2018 might be a harbinger of things to come,” JPMorgan Chief Executive Officer Jamie Dimon said in his annual letter to shareholders earlier this week. But a global index of returns compiled by Hedge Fund Research is showing a rise so far this year of just a bit more than 3 percent — compared with gains of 15 percent for both the S&P 500 Index and the Stoxx Europe 600 index. Unless the hedge-fund community can outpace the broader market, European investors may find themselves with a bad case of buyer’s remorse.